When Life Gives You Lemons ... | Travel Musings • Yummy Insights • Join me on my tasty journey! … make Lemon Pudding Cake! Oh, I know, the “Life gives you lemons” bit is a bit cliche, but there’s nothing cliche about my zest for all things lemon. My love for lemon-everything began early-on. Lemon meringue pie (why don’t I make those more often?! ), lemonade (what could be more refreshing? ), and my all-time favorite lemon dessert: Lemon Pudding Cake clearly had a dramatic effect on me growing up. My family was never big on desserts – or, I should say: the children in my family rarely indulged in desserts and sweets. I’m positive that it had nothing to do with dental caries, and more to do with raising four kids on the cheap. But I do have vague recollections of waking early in the morning and seeing remnants of (gasp!) desserts shared by my mom and dad. Ice cream dishes with an enviable coating of homemade caramel sauce was what I remember most for some reason. But of the desserts we shared in our family, my favorite by far was the Lemon Pudding Cake. Beat egg yolks, lemon juice, rind and melted butter until thick and lemony-colored. Combine sugar, flour & salt; add alternately with milk (many times I’ll go half milk / half cream) to the yolk mixture – beating well after each addition. Beat egg whites until they form stiff, glossy peaks. Fold into batter with a spatula, then nearly/fully integrate with a spoon. Spoon into ramekins being sure to keep a good ratio of the frothy-part of the batter to the gooier part. Set ramekins into a dish of hot water, then into the oven. 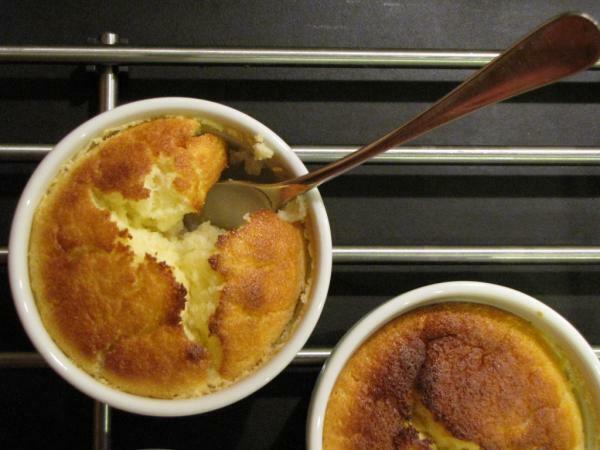 (My mom always baked this in a larger pan suitable to be divided up for four servings, but I love individual ramekins!) Bake at 350 for 35-45 minutes. And now that I’ve typed this out and thought long and hard about moms and desserts and lemons, I find myself thinking about my mom’s delicious custardy peach pie. But, that’s another story.